The psychological thriller was created by Marti Noxon and directed by Jean-Marc Vallée. Golden Globe-winning actress Amy Adams plays the leading role of Camille Preaker, a crime reporter recently discharged from a psychiatric hospital after years of self-harming. Camille returns to her tiny hometown of Wind Gap, Missouri to investigate the murders of two young girls. Dogged by her own demons, she must unravel the puzzle of her own past if she wants to get the scoop for her boss back on Chicago. 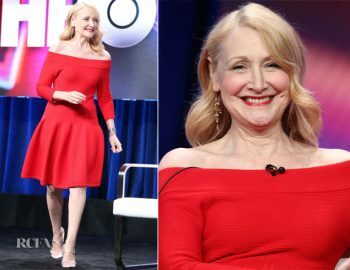 Camille’s oddball mother, Adora Crellin, is played by veteran Emmy-winning actress Patricia Clarkson. It soon transpires that the killer is a Wind Gap native, not a stranger. As the investigation unfolds, Camille is distressed to find it coming closer and closer to home. SHARP OBJECTS was Gillian Flynn’s well-reviewed 2006 debut novel. Her next two books were DARK PLACES (2009) and GONE GIRL (2012). All of Flynn’s novels reach far beyond the usual requirements of the crime thriller and feature female protagonists who are as psychologically complex as the stories they inhabit. DARK PLACES and GONE GIRL have both been adapted into feature films. The HBO series SHARP OBJECTS was discussed in detail at a panel convened on Wednesday, July 25th, 2018 at the 2018 Summer TCA Press Tours held at the Beverly Hilton Hotel. Present were author and executive producer Gillian Flynn; series star and first-time executive producer Amy Adams; series stars Patricia Clarkson, Eliza Scanlen, and Chris Messina; executive producer and director Jean-Marc Vallée; and executive producer and showrunner Marti Noxon. 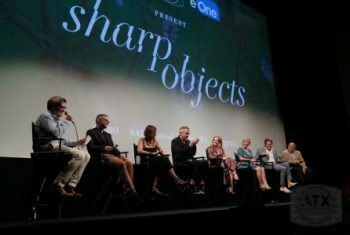 SHARP OBJECTS was reported to be “the show of the summer” at the HBO executive panel hosted by President of Programming Casey Bloys on the same day. A writer’s heart is on the page of everything he or she creates. How might writers react when they see a television adaptation of one of their books? “It’s very exciting,” said Gillian Flynn. 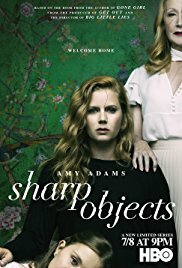 The SHARP OBJECTS series took 12 years to create, but seems to have been worth the wait! Flynn was in the writer’s room every day while SHARP OBJECTS was coming to life. She felt that this story needed a mini-series as the character study of Camille Preaker might have gotten lost during a two-hour mystery-driven version. Amy Adams was struck by audience reactions to SHARP OBJECTS’ accurate telling of female trauma, which she found very validating. “We often make women the victims of something, but Camille is also very active in this,” she added. Amy Adams added, “Going home to my daughter and my husband and making dinner or doing something very domestic always helps me reground myself and get me back into my own reality.” Her bouts of insomnia didn’t belong to her–they belonged to Camille! Amy Adams and Australian actress Eliza Scanlen admitted that they had felt crazy at least occasionally during the filming of SHARP OBJECTS. Adams had to mimic cutting her own flesh. Marti Noxon’s career specializes in women dealing with trauma. How might this project differ from some of the others? “I think a lot of people — not just women, just people — can relate to this idea that you’re hiding the damage that you feel from everybody around you. And yet, you just go on,” Noxon said. Strangely, the “dead girl” genre is very male dominated. Is it time for programming like SHARP OBJECTS to reclaim this trope? Chris Messina confessed that it could be intimidating to work with a crew of such gifted women. “They make you better!” he chuckled. He had actually collaborated with Adams and Clarkson before. ENTERTAINMENT WEEKLY reporter and writer, experience which informed her portrayal of Camille Preaker. “You learn that there’s no goddess of gorgeous writing who is going to come from on high. You just have to sit down. . .and get the work done,” she said. Amen to that! “We’re not talking about a Season 2 [for SHARP OBJECTS]. This is it. So bask in it while you can,” said Marti Noxon in closing. You heard it here!